If you’ve got a healthy budget and an uncompromising desire for one of the finest sliding compound miter saws available, you’re in for a real treat. In today’s Festool Kapex KS 120 miter saw review, we’ll explore the shower of benefits offered by this jaw-dropping saw fit for any workshop and equally at home in a professional setting. 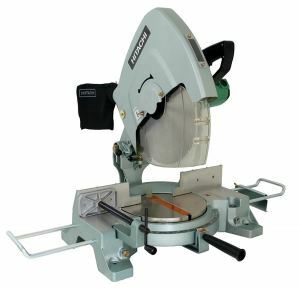 If you’ve always wanted the cutting capacity of a 12-inch miter saw but you don’t want to sacrifice the workshop real estate, the KS 120 is the obvious solution. It weighs in at just 47 pounds and it’s got a very small footprint. For very fine trim work, the precision of the Kapex is guaranteed thanks to an innovative rail forward design. The rails are just over 1-inch in diameter – 30mm since Festool uses the metric system – and they’re set at such a width that head play is all but eliminated. As if the Festool wasn’t already compact enough, this design also allows you to pop your saw flush against a wall saving further space. Variable speed is key with the best miter saws and you’ll be able to fine-tune the pace depending on the application from 1400RPM up to 3400RPM where the Kapex maxes out. Festool’s proprietary multi-material control (MMC) electronics ensure the blade’s speed is constant when under load and goes some way toward preventing motor burnout. Cutting capacity is simply awesome. 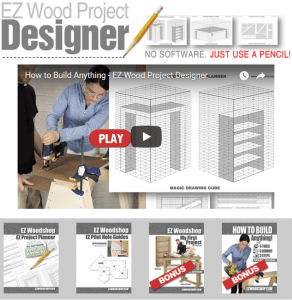 You’ll get more cutting work done in less time with no dip in accuracy. Cutting depth is a supreme 12 x 3 15/32 inches. 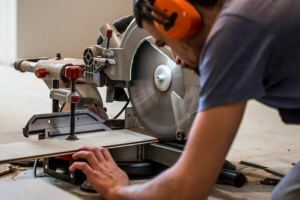 You’ll be able to cut your material vertically up to 4 3/4 inches x ¾ inch. These figures are exceptional for a 10-inch miter saw. The thin-kerf blades increase accuracy while dampening down vibration. Swapping them out is a cinch with Festool’s FastFix blade change system. You’ll be able to make micro-adjustments so you can fine-tune the bevel of your cut with stunning accuracy. This is accurate to fractions of a degree. Packing a counter spring balanced head, once this bevel angle is set, it won’t move out of line before you’ve got time to lock it in. The bevel angle display is crisp and easy to read. Alignment is simplified thanks to a pair of lasers. With 3 axis adjustment controls, you’ll be able to tweak the lasers to the left or right and enjoy a clear line of sight at all times. These lasers are battery-powered and you can activate them with a button even when the saw is off. For still broader functionality, you can flip a handy knob and the Festool lets you cut trenches for lap joints or navigating pipework. Adjusting the trenching depth is a breeze so enjoy the freedom of dado cuts and, at the turn of the knob, you can get back to your miter cuts without breaking your stride. Proper dust extraction is paramount for safety and comfort in the workshop. The Festool has a dust port and hood. Connect it to your shop vac or integrate seamlessly with any Festool dust extraction system. These tools are expressly designed to work with ruthless efficiency in complete harmony. Be aware that the quoted figure of 91% dust extraction applies when connected to a Festool dust extractor and you will need to buy this separately. If you’re on the fence there, check out our review for some more info. 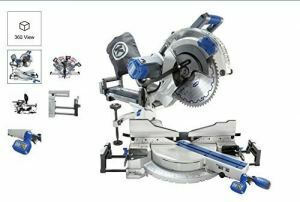 As well as the miter saw itself, you’ll get a top-notch clamp, MiterFast Angle Transfer Device, wrench and 10-inch blade thrown in. Festool’s class-leading 3-year limited warranty ices the cake. You’re assured that parts will be available for a full 10-years giving you confidence in your investment. Repairs are swiftly turned around in 48 hours. There’s even a 30-day money back guarantee in place so, really, what have you got to lose? The best things in life are rarely cheap and the Festool KS 120 is no exception. 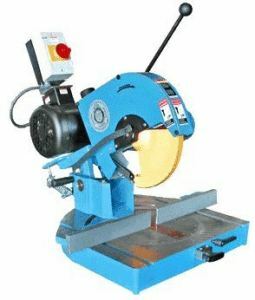 Although this is certainly a saw fit for commercial purposes as well as home use, think about precisely how much you’ll use it. There is a body of customer feedback suggesting issues with the motor if it’s hammered all day every day with extremely demanding applications. We feel duty bound to point this out as it’s all about intended usage with any power tool so think seriously about the scope of work you have in mind. With this one disclaimer – along with the price tag, of course! – we simply cannot recommend the Festool KS 120 highly enough. 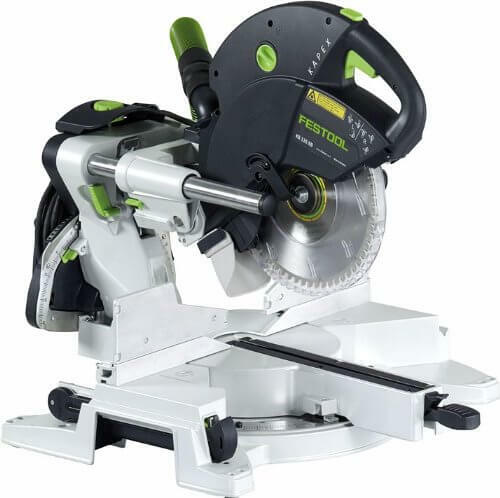 You’ll get the most accurate cuts every time, an outstanding cutting capacity to trump that of larger saws and the security of buying into the Festool brand. Once you choose Festool, you’ll never go back and your collection is sure to grow! Check out the KS 120 today if you’re looking for a top-tier sliding compound miter saw built to last for years from an industry legend.